Another original and exclusive creation by The Magic of Sherry and Krall! The Phobia escape sits on top of a stainless steel straitjacket and is completely transparent with acrylic sides, hasps and hinges. Richard Sherry shows one padlock and supplies seven keys to seven spectators. Each spectator tries their key in the padlock. None unlock it. An eighth key is supplied and the lock is opened successfully. The keys are shuffled in a hat or bag and each spectator is asked to select a key, leaving one key for Richard. This process is repeated for the second padlock. At the end of the process the seven spectators have chosen two keys each and Richard has the two remaining keys. Richard Sherry's head is placed inside the acrylic box and the stock is secured around his neck. The front panel comes down and is secured with the two padlocks through the industrial strength acrylic hasps. 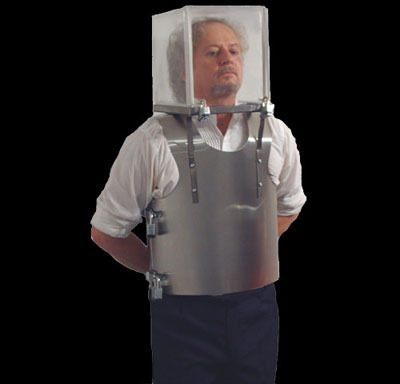 Richard's hands are secured behind his back with the shackle of the Stainless Steel Straitjacket and the acrylic box is filled with water. Richard has precious seconds to free his bound hands and try to open the two padlocks with the keys he was given or drown in front of a live audience! The Dreaded Fatality escape is an original creation of Sherry and Krall Magic. All rights reserved.